In my cruise of last autumn, I managed to stay weight-stable (I lost about the same amount as my normal daily fluctuation, so I don’t count that as a definite loss). After I returned from the cruise, I slacked off a bit, and as a result, gained about 10 lbs over the next 2 months. I decided to try for some weight loss on a cruise we took in January. 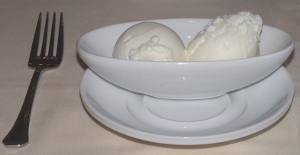 Sugar-Free Ice Cream for dessert last night of the cruise. In general, I felt that I had done better on this cruise than I did on the last. So, how did I do? Weight stable. No loss, no gain. That was a bit of a disappointment, but on the positive side, I know that I can cruise, eat plenty of tasty food, never go hungry, and still not gain weight. I’ve trimmed a couple of pounds since the cruise, but as I get older, the process seems to go slower. We just returned from an 8-day charter aboard the Carnival Freedom with 2,960 fun-loving folks, and I wanted to let you know about my eating plan and weight gain/loss results for the cruise. First off, I should let you know that I lost (by choice) 60lbs. in 2012, using the Medifast/Take Shape for Life plan. The weight came off easily, and I have held my loss for over a year now. I went from 278 (I’m 6’4″) to 218-220 in four months, and toward the end of the weight-loss phase of the program, I decided to adopt a vegetarian diet. I have been vegetarian now since March of 2012, after 55 years and three months of being an omnivore. I find it easy and satisfying to eat this way, eating mostly whole plants as close to their natural, unprocessed state, and I still do enjoy small amounts of milk/eggs/cheese. There is no flesh, seafood, poultry or pork in my diet, yet I still enjoy plenty of fine craft beers, wine, mixed drinks, and the huge spectrum of plant-based foods. For this 8-day cruise, and our two prior cruises in 2012 since I became vegetarian, I kept to my plant-based diet aboard the ship. I simply chose from, ordered and ate the vegetarian items available at every meal, whether it was the Lido buffet for breakfast, the pool snack line for lunch, or in the dining room for dinner. I was never lacking for several nice, fresh choices of what to eat, and I enjoyed every bite of every item that crossed my lips all week long. I should also say that among all our table mates on the last three cruises (10-day Eastern Caribbean on the HAL Maasdam in December, 2012; 15-day trans-Canal on the Celebrity Millennium in May, 2012, and this 8-day Southern Caribbean on the Freedom in February, 2012), I was the only one never to send a dish back to the kitchen. I ate and enjoyed every bite of everything they brought me; I was fully satisfied at every meal; was never the slightest bit hungry between meals; and had plenty of energy for all the many activities we enjoyed on each cruise. Aside from choosing only plant-based foods with some dairy items as treats, nothing was off-limits for me: desserts, cookies, ice cream, huge salads, delicious hot entrées at every meal, tortilla chips, pretzels, peanuts, frozen drinks, etc.. I fully enjoyed nearly everything coming out of Freedom’s galleys, with the exception of any meat. We also observed our usual stairs-vs.-elevator practice of “3 floors or less, take the stairs,” and so we wound up using the stairs many times every day on each cruise since our cabin was on a middle deck each time. On Freedom, I took the elevator only twice all week: once going UP from the Deck 0 gangway to our cabin on Deck 6 after our shore excursion in Panama; and finally taking the elevator three floors DOWN when disembarking the ship with all our luggage in hand for the self-assist debarkation in Port Everglades. Everywhere else on the ship, we walked, and I enjoyed four 45-minute walks around the track on Deck 12 during the week, as I do here at home every day. So, for this 8-day cruise, during which I managed to ring up a $496 bar tab in eight days, my weight change as of the morning after our return was 0.0lbs. I left home at 220, and returned at 224 last night. This morning, I weighed in at 220 flat, with the typical 2-3-lbs. of overnight water loss. This diet works well for me, and I am sure I will be able to keep a vegetarian diet the rest of my life. My blood cholesterol, which was never higher than 180 going back through 20 years of blood donation records, is now holding between 137 and 141 for the past year’s worth of donations. I am on no medications, and I take no vitamin or mineral supplements except for one 250mg B-12 tablet once a week. Hope all is well with you two! We sail again (at the latest) next February on the HAL Nieuw Amsterdam on another fun charter. Good to hear from you, Mike! I’m glad that your vegetarian diet is working for you. It worked for me, too, back about 25 years ago. For about a year and a half. Which, as I’ve found, is a fairly common experience. It’s not so much what you are eating, it’s what you are *not* eating. It takes a while for the dietary deficiencies to catch up with you. Generally, a person going vegetarian feels great for about a year, then the benefits slowly start to wane, at which time the vegetarian tends to go into denial until his or her health declines to a point where something’s so bad it requires medical care. Sometimes the vegetarian remains in denial even then, e.g. Steve Jobs, who suffered from an extreme eating disorder sometimes called veganism, but stuck to it until it killed him. He not only stuck to it, but redoubled his efforts to restrict his diet even more after he became seriously ill. Since you are consuming some animal products (diary), you may well go for more than a year before your health starts to decline. If you have increased your consumption of industrial seed oils (cottonseed, peanut, soy, canola, and corn oil & margarine), you are setting yourself up for a really bad experience in about two to three years. That was one of the main errors I made in my initial change to a low-carb diet. The damage done by excess omega-6 and transfat typically lasts 15 to 20 years after you figure it out and quit doing that. It’s also good that you are taking B12, for which there is no natural vegetarian source. You might actually be getting enough from your diary consumption, but recent evidence shows that as you age, your ability to absorb B12 declines. One of the most dramatic changes I have experienced was in response to taking megadose B12 daily. Enjoy it while it’s working for you. But I hope you have sense enough to change when it quits working.